Since 1999, Pamanong Trading Co. has been committed to ethically sourcing and supplying the highest quality Mil-Spec equipment and spare parts to Korean Defense/Aerospace market. We can proudly say that we have fully experienced staffs ready to help foreign product lines who want to sell to our market. 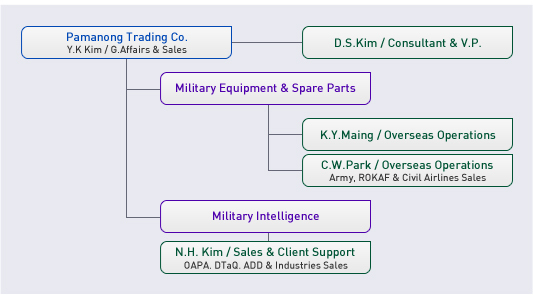 With a history of last decade of support and service and now as a Korea leading supplier, we can proudly say successful management of a diverse customer and supplier base is expand to modernize our military forces and related industries developments.